Green-Star is an NRMCA (National Ready Mixed Concrete Association) certification program. It requires the development and implementation of an Environmental Management System ( EMS , see below for more information) and a commitment to continual environmental improvement. It will give a certified concrete plant a strong competitive advantage in participating in the "green building" movement, provide significantly enhanced environmental compliance, and identifies those environmental leaders in the concrete industry. What is an EMS ? An Environmental Management System (EMS) is a key component of a successful environmental program at a concrete or construction materials company. An EMS can provide real benefits to any company or plant, regardless of size or level of sophistication; for all, it will provide a mechanism for enhanced regulatory compliance and continual environmental improvement. RMA can help you however necessary with achieving Green-Star certification, whether it be complete turn-key services of EMS development leading to eventual certification, training your staff on how to "do it themselves", or supplying a template for EMS development. Green-Star, and the use of an EMS, can open a whole new world of OPPORTUNITY to you at your concrete plant. Get on board the movement now to take full advantage. Contact us today to discuss how we can help you with this exciting opportunity! The Green-Star Program of the National Ready Mixed Concrete Association has been designed by the Environmental Task Group of the Operations, Environment and Safety Committee (NRMCA-OES) as a means to support the efforts of the ready mixed concrete industry towards environmental excellence, through the recognition of the use of Environmental Management Systems (EMS) as a tool for environmental benchmarking and continual improvement, and as a means to recognize those who adhere to essential principals of the environmental and sustainability movement of our industry. The Green-Star Program will serve as a useful mechanism to recognize those within the industry who have achieved or are actively working towards environmental excellence and/or a demonstrable reduction of environmental impacts, following the principals of sustainability. It will also provide a formal opportunity for the recognition of those companies through a rigorous, structured certification process capable of withstanding third-party oversight. The foundation of the Green-Star program was created in collaboration with the Environmental Protection Agency’s Green Highways Partnership and the 10 Guiding Principles of Environmental Stewardship. Favored Status – Customers favor doing business with organizations that are known to be protective of the environment. Increased Profits – Organizations will attain savings through its efforts in pollution prevention and waste reduction. Improved Efficiency – Sound, consistent environmental management methods will improve profits. Community Goodwill – An organization's stand on environmental policy and action may be the most important factor in achieving and maintaining the community’s goodwill. Reduction of Liability and Risk – An organization is less apt to have environmental problems by using a proactive EMS that documents results and has continual improvement. The NRMCA encourages all companies to take a closer look at the Green-Star Program and its existing Environmental Management System and start the process of becoming Green-Star Certified. The Green-Star Program utilizes a company’s existing Environmental Management System based on the "Plan-Do-Check-Act" model of continual improvement. Considering that the Green-Star Program has been created to provide the ready mixed concrete industry with an “industry specific” program that focuses on the unique operational characteristics of the industry, it may therefore serve to fill the gap between industry efforts and other Environmental Management Systems (EMS)-based certification programs (e.g., USEPA Performance Track, ISO 14001, etc.). While it is not meant to take the place of such programs, it can serve as an effective alternative to these programs due to its enhanced accessibility to the concrete industry. As a concrete plant manager, environmental manager, compliance manager, executive or anyone with fiscal and/or environmental responsibilities, do you know the details concerning your company’s responsibilities when it comes to EPA regulations, the Clean Water Act, Discharge Permits, Stormwater Management, and a host of other critical environmental matters. If not you’ll benefit from NRMCA’s Environmental Professional Certification Course; 2½ days of intense learning on environmental issues facing the ready mixed concrete industry; including a new module on implementing the NRMCA Green-Star Plant Certification.This course gives you the tools, information and hands-on experience you need at your facilities. Thanks for God. Within few months only, i had finshed the inspection and the evalution of all ready mix concrete in Jeddah, some in Taif, Qaseem and Dubai in UAE. I explained for all above (total of 50) the importance of Qualiy and Environment for each plant. I had given them my web site for more details about the requirement of the green star certificate. 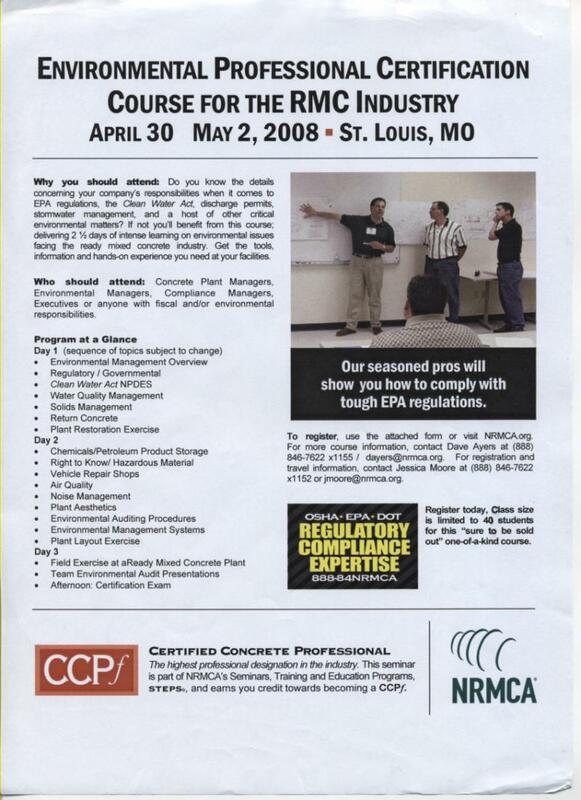 After completing my environmental concrete course last May 2008, at St. Louis, MO, USA, I can recommend any read mix concrete outside USA to Green Star certificate. 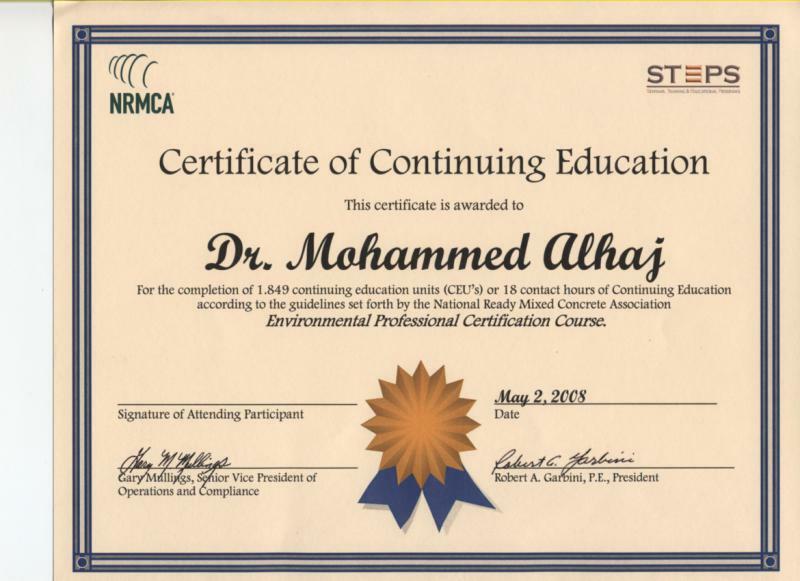 This certificate will be given to the ready mix concrete in and out USA if the plant manger had attend the environmental course and his plant had satisfied all requirement for ISO 14001 for environment and green star for health and safety. More over the patch plant must make a positive role in global warming reduction and reduction in health problems for the workers and residents near the ready plant. See www.dralhaj.com about green star and Altawe. I have verbal agreement from the Saudi council for green building and some counltant at the department of environmental and health protection in Saudi Arabia to educate and explain the adverse environmental effects of ready mix concrete on the health and safety of the people in Saudi. I distributed many articles for all of them as educational materials. We need now more action and co-operation from amanat jeddah and ready mix concrete producers. I showed US environmental engineer the pictures of some ready mix concrete including ALTAWE , he was happy with the level of ALTAWE in Third world country like Saudi Arabia. After my recommendation and the nice pictures of ALTAWE, He agree to approve ALtawe for the green star certificate. By this major step ALTAWE will be the only one out USA who had the green star and also the only one in the world who had the both certificate ISO environment for the world and green star for USA. To make his visit useful, i asked him to stay more days to give short course and give environmental recommendations for the approved ready mix concrete at Amannat Jeddah. Altawe will pay all 4-days fees + tickets + hotel. I asked Dr Hamed Algamde the manger of concrete council at Muncipility of Jeddah to send letter or fax for 15 - 20 approved ready mix concrete to encourage them to make this visit a histroical and environmental visit. I prefer the ready mix concrete who had ISO for quality. This the first time visit outside USA from the above engineer or any environmental engineer since 1950. I am in USA NOW FOR ONE MONTH preparing for the first time visit for a US environmental engineer who will visit JEDDAH , SAUDI ARABIA TO GIVE A GREEN STAR CERTIFICATE FOR AL-TAWI ON SATURDAY 2ND WEEK OF NOVEMBER. He will give a SHORT COURSE FOR READY MIX MANGERS ON SUNDAY FOLLOWED BY A ENVIRONMENTAL VISIT TO EACH FACTORY WHO had paid the fees. 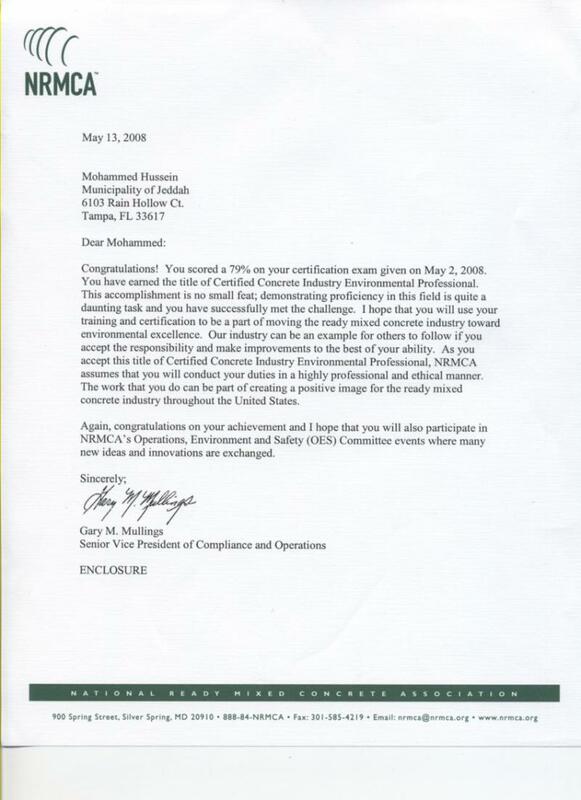 I had joined Saudi Green building council with 3 Saudi architectural engineers as board members under the supervision of R.H. prince Turkey bin Nasser bin Abdul-Aziz last June 2008. 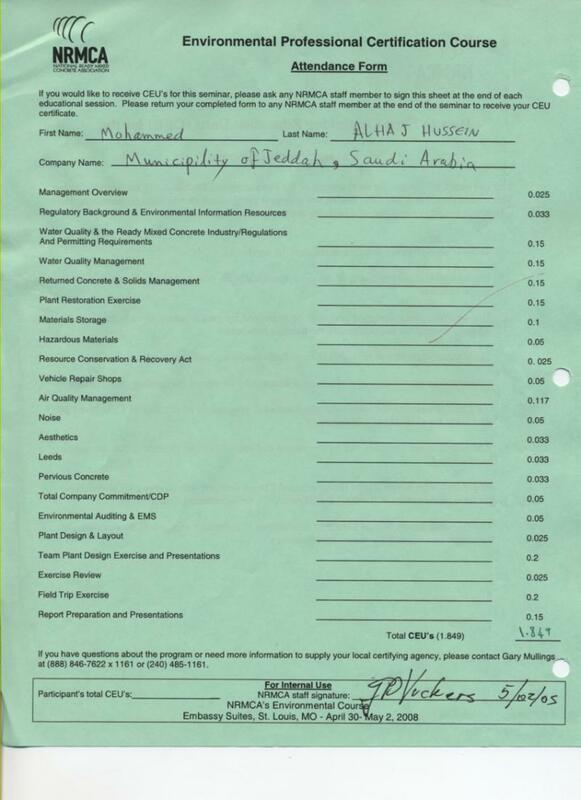 R.H. prince Turkey bin Nasser bin Abdul-Ariz the manger of the department of environmental and health protection in Saudi Arabia and Saudi council for green building and his consultants were informed in the last meeting that only altawe had ISO for environment in SAUDI, whilst 25 ready mix concrete in Dubai had ISO for environment. So i decided to explain the benefits of getting ISO environments and green star for all ready mix concrete in Saudi to increase the number of ready mix concrete in jeddah who had satisfied the environmental requirement for their plant. With Green-Star, realize that it has a certain set or requirements, which are similar but not necessarily identical to the ISO 14001 standards. Green-Star is the creation of the National Ready Mixed Concrete Association here in the US (but can apply to any NRMCA member or non-member in the ready mixed concrete industry worldwide), while ISO 14001 is the international set ISO standards. 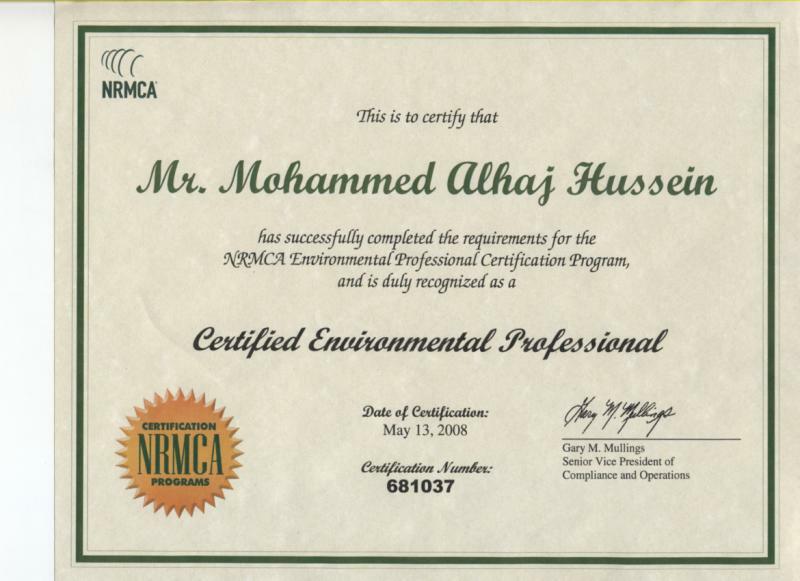 They are both similar, in that they both are an EMS-based (Environmental management System) certification program. ISO 14001 usually requires more documentation and is more in-depth that what Green-Star requires, so if a facility is ISO 14001 certified, () it is likely that it may meet the requirement for Green-Star right away.